I call the likes of me accidental cooks. When I moved out of college, I had no idea how to cook a proper meal. In due time, with some help from my friends and mom, I managed to scrape together edible concussions on my plate. Here are my tips to help you survive the ordeal. Please consider the fact that this is true to a guy who wants to thrive on Indian cuisine. Buy an oven, get a gas connection. Duh! That is the first step, unless you want to go all environment friendly and prefer cooking in a solar cooker. In that case, all the best for rainy days. Buy the minimum number of utensils. Chances are that you will have no idea about what looks good in a kitchen and what actually will be beneficial in the long run. I can give you three things you must buy – a cooking pan / wok, a saucepan without any handle and a pressure cooker. Nothing else is needed to start off. You might want to get a spatula, a ladle and a few serving plates. Don’t invite your friends immediately. Cultivate a mindset that what you will prepare may not look good. Your aim should be tasty, not stylish. I have seen a lot of people who see attractive food shots on TV and want to cook like that. If that’s your ambition and you are at zero, follow my advice until you can at least make three decent dishes. You can then discard all of it and dive headfirst into the ambition. Learn the first failsafe dish. A slurry concussion of rice and lentils, better known as khichdi. 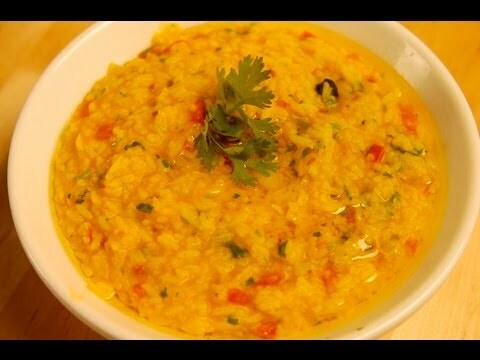 Put equal amount of rice and dal (lentil of your choice), add some salt, chill, turmeric, water and cook it in a pressure cooker for 12-15 minutes. This recipie will save you umpteen number of times. Make this your go to dish when you don’t feel like cooking. The colour will change depending on the choice of lentil, turmeric, tomatoes, etc. About ingredients – less is more. The beginner’s mistake most people (including me) make is the tendency to over use ingredients and spices. They must realise that boiling potatoes, carrots and cauliflower and then adding some salt and pepper will be tastier than creating a complex dish just because you saw it on some reality cooking show. Again, use as less as possible. If you are not aware how two vegetables and one spice will interact in terms of taste, you will have no idea of how ten different ingredient will taste when cooked. When in doubt refer to point no. 3 in this article. Know the basics of using onions, tomato, garlic and ginger. This one is a bit tough and you might need to understand and experiment a bit as a novice. Since these ingredients are used right on the oil at the very beginning, they are very important in imparting a distinct flavour to your food. I can tell you how important they are. Click on this link. It does an image search of the phrase “onions tomato garlic and ginger”. I can tell you that 95% of the dishes on that results page start out simply with the cooking of onions, tomato, garlic and ginger in oil. Learn at least two dishes that can be cooked (nearly) unattended. a) A pumpkin+potato dry dish. I put diced potato and pumpkin in heated oil, add some salt, pepper and turmeric and let it cook for over 45 mins on a very low flame. Once in 15 minutes, I stir it around. Know how to cook eggs. If you don’t like the linked videos, search on Youtube. You will get something to your liking. Know how ghee will save your veg dish. Non vegetarian dishes are hard to screw up. The distinct favour of chicken, fish, lamb or prawns contaminate the entire dish. As a result, even if you have messed up a bit of prep work, the dish nearly turns out fine. Know that this is not true for vegetarian dishes. The strong aroma of ghee often masks any mild unpleasant smell that may come out of your veg dishes. Use it with a tad bit caution though. The first step is to buy a refrigerator. At least invest in an used one. This one will help you store the raw stuff and will help you take care of the surpluses. As an accidental cook, you wouldn’t want to cook everyday. It is always better to cook once and consume twice or thrice. The half an hour of effort that you will put into the dish pays itself back multiple times. Then, make a realistic list of items you will cook in the coming week. Break down the recipe to get the ingredients. Stock your refrigerator with only those items. Stick to it for three weeks and you will learn two things. The first one is the amount of ingredient that goes into each dish and how much should you buy in the first place. For the second one, you have to listen closely. Can you hear your stomach and your wallet thanking you? Leave a comment below if you have faced issues becoming an accidental cook. It would be great to hear from someone who has walked down that path or is willing to walk down that path.